Costumes and individuality are encouraged at the Mothman Festival. Multitudes of people come out to experience the annual Mothman Festival. POINT PLEASANT — The time of year to celebrate the city’s infamous red-eyed creature is just around the corner. 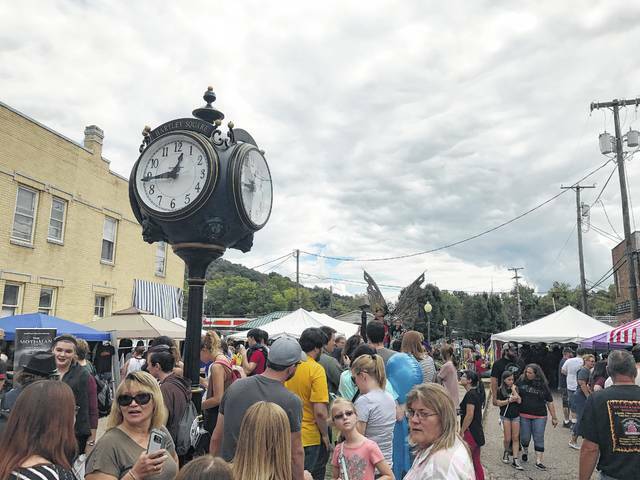 The 17th annual Mothman Festival is set for Saturday, Sept. 15 and Sunday, Sept. 16, with a kick start to the event happening on Friday evening, Sept. 14 on Main Street in Point Pleasant. Wamsley shared this festival originally began as a way to attract people to Main Street in a unique way, commemorating the West Virginia Mothman sightings that happened in 1966 around Point Pleasant. He commented when this all began, he and fellow event organizers never dreamed it would grow as large as it has. Recently, because of the increase of folks coming to the city on Friday, a kick start event was added to the agenda and is returning this year. Beginning at 6 p.m., on Friday evening, at the historic state theater, three features from the Small Town Monsters will be shown with free admission. The day begins early on Saturday with the Mothman 5K at 7 a.m. Registration will be at the 400 Main Street and line up is on Eighth Street. For festival goers wanting to explore, the TNT area guided bus tours will begin at 10 a.m., lasting until 10 p.m.. Each tour lasts approximately 60-75 minutes at $20 per person. The tour bus will leave from the Mason County Courthouse and those on the tour are advised to arrive 15 minutes early. The TNT bus tours are also offered on Sunday beginning at 10 a.m. and ending at 4 p.m. In the evening, festival goers can also take a Mothman Hayride starting at the West Virginia State Farm Museum. The hayrides begin around 7 p.m. and end around 11 p.m., tickets cost $5, cash only. The tickets will go on sale Saturday morning of the festival and are sold on a first come, first serve basis. Wamsley commented the ticket sale is likely to begin at 9 a.m. this year. Also, throughout the day festival goers will see people dressed up in their favorite costumes. All are welcome to participate in the cosplay fun. The cosplay groups Star Wars – The 501st Legion and The Ghostbusters – W.Va. and Ohio Chapters will be in attendance and a Fallout 76 fan event will also be held. The fun does not end there, festival goers will be able to enjoy live entertainment, guest speakers, and a wide array of Mothman/paranormal themed vendors such as artists, authors, merchants, hobbyists, handcrafted artists/boutique owners, food trucks, food carts, food booths, lemonade stands, ice cream trucks, etc. will be set up along Main Street on both Saturday and Sunday of the event. Optional paid parking for the festival on Saturday will be at Krodel Park for $10 with a shuttle service available for tips. Wamsley shared the paid parking fee will be collected by the City of Point Pleasant with the money going towards the Point Pleasant Splash Pad. The tips for the shuttle service will be a donation to the senior citizens home. On Sunday, parking is free at Krodel. Along the street parking near the festival is an option, but spots will fill quickly. Wamsley commented the parking is “crazy” and it is advised to arrive early at the festival for better parking options. To keep up with updates on the festival, a free Mothman app has recently been launched and is available for download at the App Store or Google Apps. Also, for more information on the Mothman Festival, visit https://www.mothmanfestival.com. https://www.mydailysentinel.com/wp-content/uploads/sites/14/2018/09/web1_9.19-1-2.jpgCostumes and individuality are encouraged at the Mothman Festival. 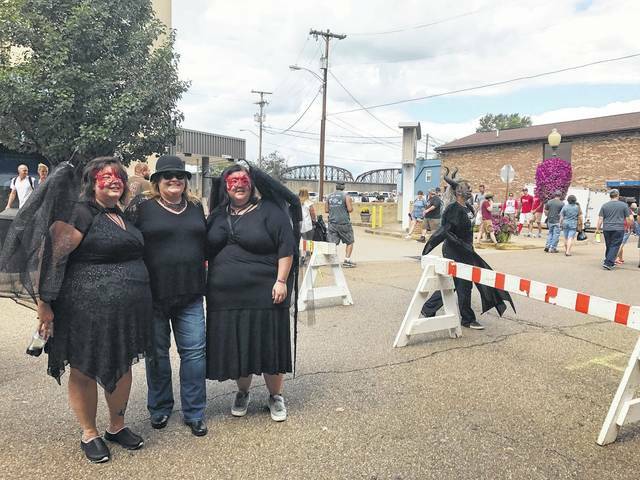 https://www.mydailysentinel.com/wp-content/uploads/sites/14/2018/09/web1_9.19-9-2.jpgMultitudes of people come out to experience the annual Mothman Festival.